Writer, we want to encourage you. Today’s post is written by Brave Writer Stacey Daze. You sit down to face the internet. It’s not quite like standing in front of an audience, for there is a blank wall between you and everyone in the world. But sometimes it’s still scary. An invisible connection which can’t be seen nor felt some days. Other days there is no denying the connection. Those days you are wrapped in the love of people far and wide and you know without a doubt that they exist and you do, too. But some days, it’s quiet. You type in your little room next to the window. The sky is blue and the grass is greening. The birds come to play at the feeder your husband put up and the squirrels catch what they drop. And your words scare you. You begin to type feeling the release, feeling the freedom, and feeling as if you are standing on a precipice all at the same time. Your little corner of the internet world is where you sometimes bare your soul. Sure, you also share soapboxes, favorite finds, and recipes. But sometimes your own words sneak out and you feel vulnerable and scared and worried as you hit publish; not knowing what to expect. You are so brave my friend. You are willing to share your heart not knowing the response you will get. You are willing to share your fears trusting that someone will help shore you up. You are willing to help us on our path as you share yours. Thank you, dear one. Thank you for being brave in the writing and in the waiting. 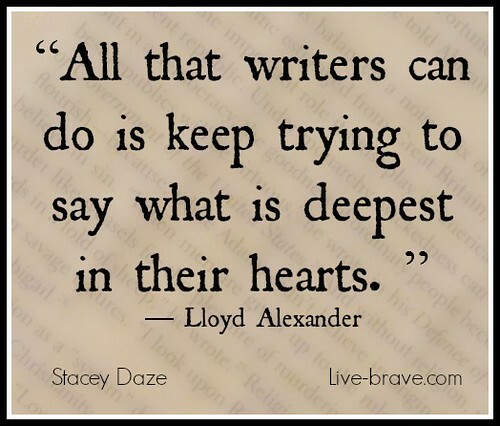 We have many brave writers here, but there are so many out in this wide internet world. People who are willing to bare their soul. Please share a link in the comments of a brave post you read this past week. Let us encourage the brave writer, whether it is you or someone else. Previous postShe Helps Me Make Sense of my Life Here on Earth. Ah, brave writing! Scary and yet wonderful at the same time. I read this post from Aprille at Beautiful in His Time yesterday- so good! Thanks for your brave writing, my friend! Love you! Thank you for sharing that link Amy! Such a thoughtful post, and really it AMAZES me that it was written in 5 minutes. WOW! It definitely gave me something to consider.